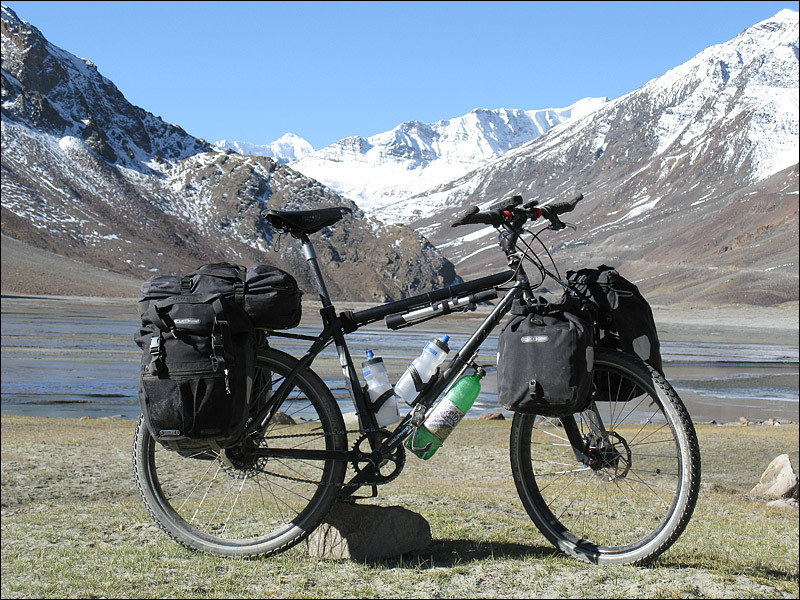 Bicycle touring in the Himalayas – kit list | What happens if I press THIS?? Orange P7 Singlespeed frame with sliding dropouts Originally bought on eBay as a round-town runabout, but the sliding dropouts meant it was an easy job to fit the Rohloff hub (also bought on eBay!). 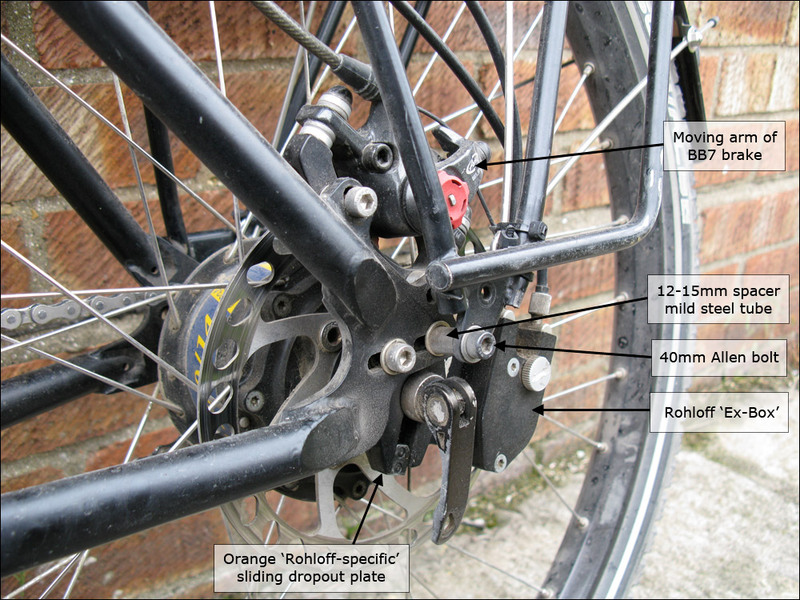 Orange sell a Rohloff-specific dropout plate too, which eliminates the need for the ugly Rohloff torque arm. The P7 is a beefy steel frame, perfect for adventure touring. Fox Vanilla 140mm coil-spring fork Essential! The roads in Ladakh are constantly subject to damage by rockfall, freeze/thaw and thundering Tata trucks, and maintenance is an ongoing, never-ending job. So surfaces vary from brand-new smooth tarmac to just about the dirtiest, bumpiest rough trail you’ve ever seen, and it pays to be prepared for the worst. These forks are a bit heavier than air-sprung equivalents, but the coil spring means less maintenance and no need to carry a shock pump. Rohloff 14sp internal gear hub 40t front, 16t rear. Noisy pedalling in gear 7 and below, noisy freewheeling in 8 and above, but super-smooth and great for stop/start on steep, bumpy corners, sealed against dirt, and maintenance free throughout the trip. Avid BB7 mechanical disk brakes These brakes were great! Cable-operated so easy to maintain, but amazing stopping power, and one set of pads lasted the whole trip. Mavic EX729 rims Bombproof. Totally. Marathon XR tyres Heavy, but super-durable and great on dry but dirty and bumpy tracks. Completely puncture-free trip. Tubus Logo rear rack It’s a great rack, but I had to do some kung-fu with long spacers to make it fit around the very busy rear hub. With the Rohloff ‘ex-box’ and the swing-arm of the BB7 brakes in the way, the only bolt I could attach it to was one of the locking bolts for the sliding dropout plate, which was less than ideal, but it did the job. Tubus Swing front rack Amazing! Glorious! Maginificent! The best bit of kit I bought, period. The bags are suspended above the moving part of the suspension fork, and are therefore isolated from the vibration giving a fantastic smooth ride – probably even smoother when the bags are heavy. The handling didn’t suffer at all because of the height of the bags – I could still ride no-handed – but I concede that when the bike is stationary the front end flops to one side or t’other like a dead horse. No big deal. Also required some long spacers to make it fit around the crown of the Fox fork, but well worth the hassle. Thoroughly recommended. Ortlieb Bike Packer Plus rear bags Light, strong and waterproof, and stayed firmly on the racks on the roughest downhill roads. My only gripe is that the inside of the ‘Plus’ series bags is shiny polyurethane (etc) and so is a bit sticky when trying to squeeze items inside. Ortlieb Front Roller Plus bags As above. Compression straps x2 Rather than bungees, to attach tent etc to rack. Brooks B17 saddle Rock solid, comfy, easy to slide about on. Enough said. Bottle cage x2 Standard size, mounted inside frame. Topeak Modula XL bottle cage Holds 1.5l bottles; mounted underneath downtube. Thorn riser stem I like my bars to be as short as possible, and straight to allow easy installation of kit, so rather than using riser bars as fashion dictated, I chose one of Thorn’s riser stems. Strong and simple. Cane Creek Ergo bar ends I like these in conjunction with standard soft rubber grips. Full set Allen keys Proper, strong, separate keys – not multi-tool. Wrench 15mm Short, single-end open-ender. 5″ length of light alloy narrow tube To put over the handle of the 15mm wrench for extra torque on pedals. Leatherman Charge Ti tool Plus accessory pack including all screwdriver/Allen/Torx bits. Great bit of kit. Swiss army knife Probably not necessary, but I feel naked without one on a trip. Topeak Mtn Morph pump Great pump – works like a small track-pump. Very easy. Inner tubes x3 Didn’t use any, but glad to have them in the bag. Folding tyre x1 lightweight Didn’t use it, but glad to have it. Park Tools emergency tyre boot Didn’t use it, but it’s as light as a feather so no big deal to carry. Puncture repair kit x3 Didn’t use them, but wouldn’t be without them. Spare brake pads x3 3 full sets front & back, but didn’t use any of them. However, given the special design it’s unlikely I’d be able to find spares on the road, so would definietly prefer to take too many than too few. Spokes 3 of each, front and back, strongest available. Bottle of wet lube Maybe the wrong choice because the roads were dirty & dusty. Duct tape Wrapped around seat-post. Used all of it and still wanted more. Take lots! Allen bolts, nuts, bolts, washers At least two of every size of Allen bolt on the bike, half-a-dozen nuts with bolts, assorted washers and spacers. Chain links About 6 links of SRAM chain including ‘powerlink’. Lock Long but lightweight lock – enough to secure two bikes to one another. String We locked our bikes to one another and laid them on the ground outside the tent, and tied a piece of dark string to the frames, which was fed through the zip of our tent and attached to a helmet inside, so if anyone tried to move the bikes in the dark we’d know all about it. Also used as our clothes drying line etc etc etc. Bike bag British Airways insisted thet we must transport our bikes in a ‘proper’ bicycle bag or box (i.e. no cardboard boxes, plastic bags, bubble-wrap etc). So we bought the cheapest possible bags, and had to arrange for them to be posted from Leh (our start point) to Manali before we left. This was a hoot – the Post Office in Leh requires that you go outside to a shop across the road and buy some linen material and take that, and your parcel, to a tailor who will sew the parcel into a tight bag, which you take back to the Post Office where they add a gazillion stamps. All a bit backward, but very cheap and not too much hassle to organise, and we used the opportunity to post gifts and excess kit that we didn’t want to carry on the route. However! It did take a LONG time for the package to arrive – ours took about 20 days to get from Leh to Manali (held up by bad weather) – it arrived the day before we were due to leave, just in the nick of time. Helmet I don’t normally wear helmets (I find them uncomfortable and sweaty), and didn’t wear mine much on the route, but if anything was likely to change my mind about helmets, it’d be negotiating some of the hairpin bends with giant Tata trucks thundering past and rockfall from the very high cuttings above. Blimey. Cateye Strada wireless computer Very small and unobtrusive, worked very well. Hilleberg Nallo GT3 Great tent with HUGE vestibule for all of our kit, and loads of space inside for two people and room for bits & bobs and clothes. Very comfy, and not too heavy either. Only (very slight) drawback is that ‘tunnel’ design tents don’t hold their shape if the pegs come out of the ground, and we were in some very sandy soil on a few nights. We had to reinforce the pegs with large boulders, and that was a big job at altitude and after a day’s cycling! We used the footprint too, to protect the groundsheet from sharp stones etc. The footprint also doubles a a great tarp for more predictably hot & dry trips (with trees!). Katadyn Pocket water filter We did use this on a couple of occasions, but we could probably have survived without. Very glad to have it though, and would definitely take it again, despite the weight. Bottled water is available regularly along the road apart from the Taglang La/More Plains road, and the locals are very keen to take used bottles and recycle them so I didn’t feel so bad about plastic waste. Iodine tablets Didn’t use them, but they don’t take up much space and it was good to know they were there. Primus Omni-fuel stove I took this because it’s supposed to be able to burn just about everything, even Yak pee if that’s all that’s available. However, we had *real* trouble getting a consistent blue flame from it once we got up to altitude, despite cleaning it thoroughly and being very diligent with the pre-heating process. Could have been altitude, could have been dirty gasoline, but I’d definitely take a compressed gas stove with me next time and a few spare cans of gas. Spare fuel bottle 500ml bottle for gasoline. Turboflame lighter Piece of crap! Doesn’t work higher than 3,000m. We had to buy loads of matches. Ortlieb 5l folding bowl Large, square, folding basin with carrying handles – very light and compact when folded, great for transporting lots of bits & bobs to the campfire and for washing-up afterwards, washing clothes etc. Exped Downmat 7LX This is a brilliant bit of kit – VERY warm and comfy even when temperature dropped below -10deg in the tent. The inflation system (also the stuff-sac) is very clever and easy to use, and doubles as a pillow. Very well thought out, WAY better than anything Thermarest have to offer. Rab 4-season down sleeping bag A warm down bag was absolutely essential for the Himalayas. On most nights in the tent the temperature was between -5 and -10deg; on a couple of nights we stayed in much larger teepee-type tents with open tops and it probably dropped to as low as -15 to -20deg, but we were totally comfy in these bags with down hoods. Great things. Packed in heavy-duty stuffsac with compression straps. Interestingly, at altitude (up to about 4,750m) packing the sleeping bags into their stuffsacs was an incredibly tiring job. I had to stop for frequent rests. 2x 2l Platypus bottle These were our ’emergency’ water bottles and we did have them filled on one of the days (More Plains) when we knew we wouldn’t be passing any settlements for 48hrs. BUT… that was a grim day, head down, into the wind, carrying all that extra weight! I was glad when we could empty the bottles again. Soap In a plastic box and (here’s a great tip) wrapped in a knotted bit of ladies’ stocking material which makes it last for ages. Wet wipes I never had these, but I wish I’d bought TONS of them! Worth their weight in gold. I became a bit of a bum on the trip and didn’t wash for about 7 days in a row because I was too scared of the freezing cold water around my privates. After 7 days though, even I had to admit that I was too stinky to be in a tent with, and I resolved to have a eash come what may. But then Ulrike said “Oh yes, I forgot to say I found this…” and a choir of angels started singing, and heavenly trumpets sounded as she pulled from her pocket… a British Airways ‘Freshen-Up’ towel!!! FANTASTIC!! A quick scrub around the privates and I was minty-fresh and good for at least another five days. Excellent. From now on these little babies will be first things to go in my bags, no matter where I’m going. Toilet paper One roll, and Ulrike was under strict instructions to NOT use the whole thing on a single visit. 6x mini-carabiners Very useful wee things, for keeping clothes on the line in wind, for attaching wet stuff to outside of Ortliebs etc. Petzl Myo XP headtorch Very good headlamp around the camp – we didn’t take any bike lights with us and these would have been bright enough for riding too if we had been caught out in the dark. Garmin Vista HCx GPS Kept locking up so not useful for recording route, but still useful as backup altimeter and navigation tool. Suunto Core altimeter watch Fantastic thing – great altimeter, thermometer, weather-forecaster, watch etc. Canon A650is compact camera I chose this because it has a good telephoto range in its zoom, at the expense of wide-angle, which suits my preference. It also uses AA batterires which are available almost everywhere in the world, but I took a bunch of non-rechargeable Lithium Energizers out with me, and one pack lasted for the whole trip. The camera was set to ‘P’ for all the photos – the only creative choice I made was to focus on a subject and ‘lock’ that by holding the shutter button half-way down while I re-composed and shot. Easy. Maps & compass We pored over maps every night, of course, but we never used the compass and could have left it at home. Maps were ‘India North’ (Nelles 1:1,500,000 series), and three ‘Editions Olizane Carte de Trekking’ Ladakh-Zanskar 1:150,000. Notebook & pen VERY important to have some kind of journal. Mini-Gorillapod Tiny but fantastic gadget-tripod, great for self-portraits of the two of us at summits etc. Will operate as a standard tripod, but legs are flexible and can hook around bike frames etc. Nylon stuffsacs About half a dozen of various sizes. Large Exped ‘drybag’ For tent or anything else which would be packed on top of the rack and outside of the bags. Hat (for sun) 1x Wide-brimmed to keep the sun off. Uncomfortably warm sometimes, and without question totally uncool, but absolutely essential for me. We passed a small group of kids one day who started laughing and running alongside, shouting: “Julay Doctor Jones!!!”. Buff neck thing Ulrike loved hers, I couldn’t really get the hang of mine. Felt like I was being strangled. Large square of light, white cotton Like a huge handkerchief, for wrapping around head/face in really strong sun. Looks daft. Doubles as tablecloth too. Padded cycling underpants x1 I cycle every day without padding, but I thought I’d appreciate it on a long tour. But I hated it because I couldn’t ‘adjust’ myself as I rode along, and I preferred to ride without any padding. Won’t take padding in future. Quick-dry underpants x2 Helly Hansen polypropylene briefs for me; any discomfort was due to my hygiene policies and not the choice of underwear! Fleece gloves Large enough to go over the Specialized cycling gloves. Very comforting on long downhill stretches! Diamox Altitude sickness tablets. We forgot to pack them, but they turned out to be essential for me during acclimatization after we flew into Leh (guest house at 3,500m). Thankfully, they’re available from a pharmacy in Leh without any prescription. A soon as we stepped off the plane we could feel the effect of the altitude – even just moving bags around seemed very much more tiring than in the UK! So we took it easy for most of that day. That night I didn’t sleep very well – I had a really bad headache and couldn’t relax. The following day the headache was still there – it was just like spending the day with a bad hangover; not very serious but enough to prevent me from enjoying the day properly. On the second night however, I thought I was going to die! My eyes felt like they were being pushed out of their sockets, and the back of my neck felt very sensitive and stiff – like my brain was swelling inside my head. I was pretty alarmed by this, because I thought it would get better rather than worse as time passed, so we arranged to go to the local hospital. That was a unique experience too – a snapshot of real life for the local folk. Anyway – the doc said it’s not uncommon for the 2nd night to be worse than the 1st, and he sent me off to get some Diamox and advised that I should try to sleep ‘propped-up’ in a sitting position. And that worked fine – I got a full night’s sleep and was able to stop the Diamox a few days later, and didn’t need to take any more even when we were sleeping at 4,500+m for a five-day stretch. Sorted. Copies & spare cash We made photocopies of all important documents and hid these in small plastic wallets in every one of our bags, and hid some spare cash in the handlebars of our bicycles. We also put scans of important documents and useful names/addresses/numbers/blood groups etc etc onto a web page which we could write down for any official in the event of a language problem. Didn’t have to use it, but it seemed like a good idea.